This bluetooth receiver for home stereo connects any bluetooth-enabled smartphones, tablets and computers to powered traditional speakers or even your A/V receiver with a 3.5mm to 3.5mm or 3.5mm to 2RCA audio cable. EDR is short for 'Enhanced Data Rate', which ensures a faster data transmission rate and much more stable connection between a Bluetooth device and the Audio Receiver. This bluetooth receiver is with built-in 200mAh battery, allowing it to provide up to 8 hours of continuous quality music playback for car systems, home theaters, smart phones, and tablets. With a quick recharge time of only 2 hours, it's easy to recharge and resume the music. Listen to Music Wirelessly: Ugreen Bluetooth Adapter makes your traditional speakers turn into a wireless sound system by plugging this adapter into your speakers, free yourself from the limitation of cables and wires. Portable Size: 2.1x 2.1x 0.5inch makes it easy to be carried and take to anywhere you like. 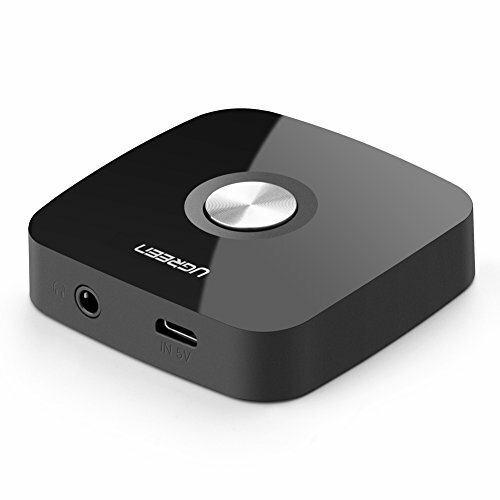 Wide Compatibility: This Bluetooth 4.1 Receiver can be connected to any A/V receivers and any powered speakers with standard 3.5mm jack, ideal for home theaters, stereo systems, and car stereos, also compatible with Smart Phones, iPod Touch, iPhone, iPad, and Android devices. NOTE: This is just a receiver not a transmitter. Advanced V4.1 + EDR Technology&Long-range Wireless: Stream and control your music with a reliable connection from up to 10 meters/33 feet and don't compromise on sound, either. Bluetooth V4.1 + EDR ensuring crystal clear sound and high quality stereo music. Easy to Setup and Pair: Just plug 3.5mm audio connector into 3.5mm jack of this adapter and pair with your Bluetooth enabled devices to enjoy music, automatic re-pairing for a hassle-free experience. Extra-long Battery Life: Provide up to 8 hours playing time and only need 2 hours to charge it fully. Please use the power adapter of DV 5V/2A Max to charge the receiver. What You Get: 1* Ugreen Bluetooth 4.1 Audio Receiver, 1* 3 feet 3.5mm Audio Cable, 1* 3 feet Micro USB 2.0 Cable, 1* Multi-language Manual, Backed by Ugreen 24-month Hassle-free Warranty and Lifetime Friendly Customer Service.